We might have millions of resources but sometimes everyone seems to want the same book at the same time and it can feel like there aren’t enough books to go around. This post will give you some tips on how to make getting hold of your core texts feel less like a crystal maze trial and more like a walk in the park. How can I get hold of my books if there aren’t any available? If you aren’t scrambling around trying to complete all your readings the night before your seminars you might w ant to consider putting a book on hold. 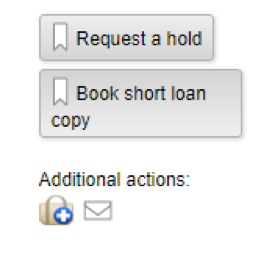 Once you have found it on Library Search all you need to do is click on the inviting ‘request a hold’ button to send off your request (see image). Once that literary lifesaver returns from its travels the Library will send you an email letting you know it is here and ready to join you on your scholarly journey. Head over to the glass area on the first floor and you will find your book ready and waiting on the left-hand side of the room. Handily they are ordered alphabetically but don’t forget to check for your Warwick ID number on the reservation slips, sometimes there is more than one copy of a book on hold! Undergraduates can put a hold on up to ten books, so get requesting! Housed in the same area and identifiable by their snazzy blue stickers is the short loan collection. These books are our most popular residents. They are in high demand so make sure you get them back before 11am the next day. Some little insider library knowledge is that if you take out a short loan on Friday, Saturday or Sunday it won’t be due back until Monday 11am, but that’s our little secret. Just don’t forget to return them on time! They won’t turn into a pumpkin, but you won’t be feeling so triumphant with fines at £1 per hour or part thereof! How can I make sure I get a short loan? If the short loan copy has also been taken out don’t despair! You can book a copy to ensure you get your hands on it. All you need to do is go back to Library Search and click ‘book short loan copy’ and choose what day you want to have it on. Just don’t forget to collect it before 4pm otherwise it will feel sad and lonely and be released into the wild for another student to use and love. What if I can’t make it to the Library? In many cases you don’t even need to leave the comfort of your room to find your textbooks! If you are like me and prefer to do much of your reading in your ‘soft office’, aka your bed, E books will become your best friend. You can access them whenever, wherever you want by just logging into library search with your Warwick ID. These books are the shining beacons of hope in the darkness of an all-nighter. You can download them, print off chapters, highlight and annotate them and even search for keywords. I don’t want to say magic, but they come very close. I need it now and nothing is available! 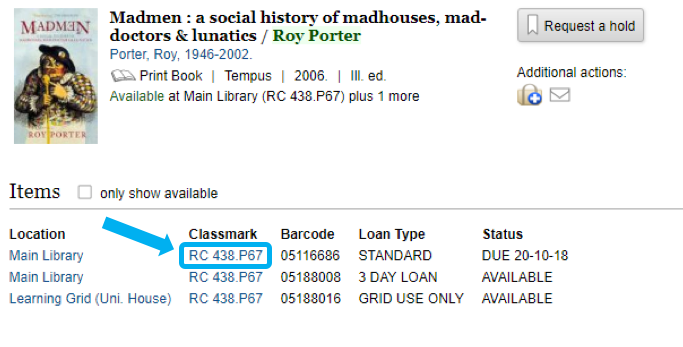 If all else fails, your saving grace might be looking for a previous edition of your textbook. Many core textbooks are revised periodically to keep them up to date, but this doesn’t necessarily mean that older books are completely useless. You might find they have exactly the information you need to get by in a pinch, so never turn a good book down. You can also browse the shelves either physically or from the comfort of your bed to find older editions or books on similar or the same topic as the one you were looking for. Just click on the classmark to access the graphical browse screen (see images below). It might not be a perfect match, but you’ll find all kinds of interesting works you didn’t know existed before! 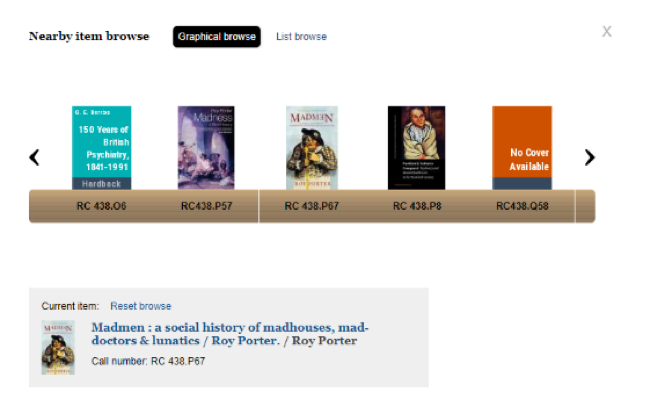 So, there we are – there’s no need for you to feel abject horror when all the copies of your core readings are on loan. Instead you can feel safe in the knowledge that you have many a trick up your sleeve to get you through the term. You need never turn up to a seminar unprepared again!